The construction industry is full of specific terms and labels that may seem confusing to the average reader. In some cases, building contractors will confuse the terms themselves and cause confusion on the project. It is essential to know the ins and outs of this complex process, as minor miscommunications can lead to major setbacks. Builders, designers, and owners nationwide rely on clear lines of communication to deliver precise results for every build. In the steel industry, people often use terms such as “fabrication” and “manufacturing” interchangeably to describe the complex process deployed by today’s contractors. Sanilac Steel is here to serve as your trusted team of structural steel fabricators in Michigan, and our modern approach to every project helps to ensure a quality outcome. Today, we’ll discuss the differences between manufacturing and fabrication for steel structures, as well as explain the value provided by our contractors for projects across the state. If you have a project coming up and are ready to get started, be sure to contact us online for assistance! Manufacturing — To make a product on a large scale using specialized labor and machining. This term often refers to the process of turning a raw material into a finished product. Fabrication — The process of assembling a specialized product using prepared parts and materials. By combining diverse components, fabricators are able to create versatile outcomes. Manufacturing and fabricating steel may sound the same on the surface, but the distinct applications do differ. In both scenarios, professionals create steel products relying on proven processes for a precise fit. Ultimately, the difference between structural steel fabrication and manufacturing shows in the purpose. Manufacturing is done to create structural steel components for use in future applications. Structural steel fabrication, on the other hand, relies on several components to assemble a robust, versatile product. It may help to think of these terms in the auto industry — one company may specialize in manufacturing the headlights for your truck, while another specializes in assembling this component with thousands of other parts to create a whole vehicle. In structural steel design, both processes are required to match the demands of today’s architecture. Structural steel fabrication is the process of creating a structure by assembling, blending, cutting, and changing components derived from raw materials. In order to meet the high structural and safety demands prevalent across the industry today, builders deploy steel for use in nearly every building application. Steel is rigid and able to support heavy loads, making it a versatile material for aviation, healthcare, retail, multi-family residences, and more. Sanilac Steel can help you create the safest and most cost-efficient outcome for your project. While we provide unbeatable structural steel services, our team can also work to provide success for personalized plans, including steel stairs, ornamental metalwork, and more. 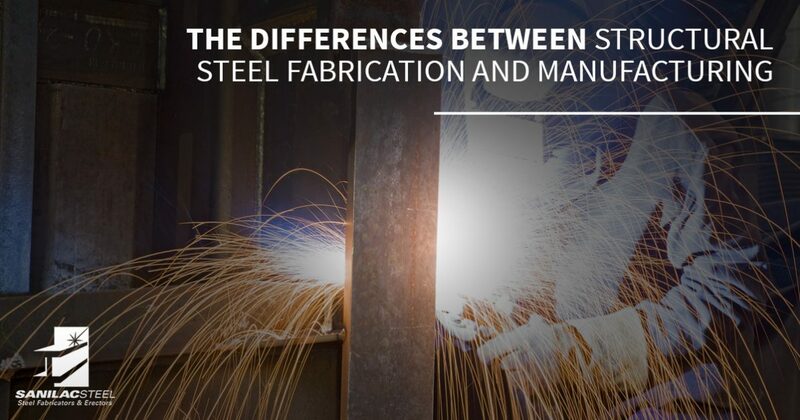 While these two terms can still be used interchangeably in most cases, it’s important to remember that some steel companies specialize in fabrication while others stick to manufacturing raw components. Sanilac Steel is here to serve as your comprehensive source for steel fabrication, manufacturing, and design. Our experienced team has the training and equipment needed to deliver a precise outcome to perfectly match your design specifications. Since 1967, our Michigan contractors have specialized in delivering efficient, affordable, and long-lasting results for every project. We can work with you to personalize a plan that best covers your project needs, whether that consists of customized manufacturing processes, fabricating complex buildings, or anything in between. If you’re looking for more than structural steel fabrication and manufacturing, then we can help with that, too! Sanilac Steel is here to deliver quality results for each of our clients, and our team is able to supply services such as mobile welding, crane rentals, custom metal work, steel structure design, and more to ensure that your project is completed as smoothly as possible. Contact us today to learn more about our structural steel manufacturing and fabricating processes, and be sure to request your project quote!